You may be wondering how these cities were selected. First, cities considered had populations of 99,000 or more. Second, these areas have the most ideal grilling days in terms of weather as gathered through the National Weather Service. Good grilling days were those days under 90 degrees with no precipitation. Clearly the west coast rocked this test, but if you look on down the list of 100 cities, you’ll find others closer your neck of the woods. So, check out the full list of great grill cities. Also, feel free to add your own city or town to the comment list. No rules here. If you’re grilling great where you live, let us know. I’ll start with Salisbury, NC. Population is around 27,000, and we have a lot of days over 90 degrees plus that southern humidity. Don't guess we'll ever make the official list. But, we do enjoy some great grilling. 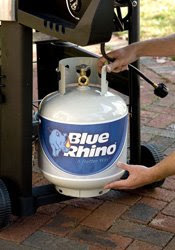 As a side note, be sure to check out the Blue Rhino recycle program. Keep those old tanks out of the landfill. Be nice to the earth.